Solitaire can be a stress reliever, or for some, a stress inducer…. I’ve been playing on the mornings when I have time, but those are fewer and farther between. I enjoy the game, and the “slow down” time it affords me, so today I was determined to play. Allowing myself 15 minutes, I started, and was pleased with the first score of 698. Then the second game had a score of 718, then 643. Odd scores, don’t you think? Yes, I admit to hitting the “undo” button, to possibly help the game move along, and quite possibly to help me achieve a better score. And a couple of times, I was going too fast, and realized, after I had turned the next group of 3 cards over, that I had a play on the last one. So I hit “undo” and made the play. We lose points when we “undo” a play, or a turn of the cards. The day had just begun, and already it was going too fast. But going back, starting again with a fresh play, didn’t seem to bother me. A Virgo, typically, I want it to be right the first time. But for some reason, today I allowed myself to stop, go back and rework it, and still I won. Does it matter how we get to the end result? It isn’t about perfection. It’s about trying, and trying again, and doing our best to meet our goals. 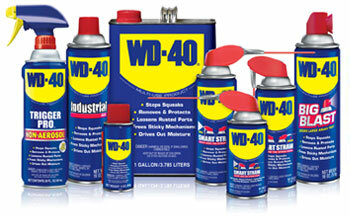 After all, it took 40 tries to come up with just the right formula for WD-40.